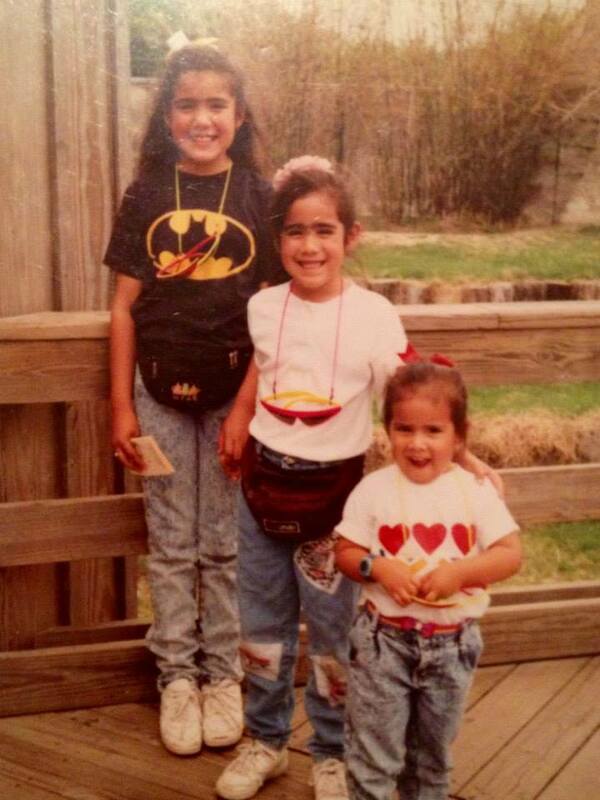 I’m the one with the amazing Batman shirt. The other two kiddos are lil’ sister and lil’ cuz (who really is a lil’ sister, too). Fair warning: This post is way personal, but it comes back to librarianship eventually. When you grow up along the U.S.-Mexico border, Mexican surnames, like mine, are the norm. The teachers, classmates, doctors, customer service workers, or really anyone I interacted with there never had a problem pronouncing my name: Veronica Inez Arellano. I took that name with me on a slight move within Texas (Houston) and later, on a big move to the Mid-Atlantic (Southern Maryland). The further I got from the border, the harder it was to say. Every sound in the name is a sound you find in the English language, and yet the variations on pronunciation were vast. That last variation was always the worst. As women are often socialized to do, I’d respond with a shy, polite smile, say “that’s ok,” and hope I hadn’t inconvenienced anyone. When their unwillingness to pronounce my name was followed by a “Where are you from?” I’d respond in the usual way–Texas. Houston. South Texas?–eventually share what the asker really wanted to know, and watch their faces fall as they learned my “beautiful/exotic/unusual” last name was Mexican, not Portuguese or Italian or some other ethnicity that didn’t evoke images of border crossings. I kept my name well into 5 years of marriage, never bothering to change it, never feeling pressured by my husband, family, or friends to change it. Then I got pregnant. Then I lost my full-term baby during his delivery. Then I got pregnant again. I felt a strong need to connect with husband, with my lost son, and with my son-to-be, all of whom shared the last name “Douglas.” So, in the emotional hellhole that is grief and the hormonal turmoil that is pregnancy, I changed my name. Inez was erased. Arellano was minimized to a middle name. Douglas was the new family name. I’ve kept my name this way for 5 years, never thinking too much about the change. It’s sort of a minor thing to focus on when you’re living on minimal sleep, nursing, potty training a toddler, trying to carve out time with your partner, and attempting to jump through tenure hoops at work. But over the past year it’s become a sore spot. It feels like a self-inflicted dis. I know it’s a stretch, but it makes me feel a bit like those people who didn’t even pretend to pronounce my original last name. I think of them every time I’m forced to type “Veronica A. Douglas” on a conference registration because “Arellano” doesn’t fit on the name tag. I think of them every time I say “Veronica Douglas” when I call my son’s preschool, or when I’m speaking to a customer service rep who I know won’t be able to understand Arellano. I think of them whenever I anglicize the pronunciation of “Veronica” so that people aren’t thrown off when the “Douglas” follows. I’m changing my name again this summer, to Veronica Inez Arellano-Douglas. Doing so is a guarantee that I will never again have a reference desk name plate that anyone can read from a distance of greater than a few inches, that my conference name tags will be a jumble of initials, and that any speaker intros I receive will leave the facilitator tongue-tied. But it feels right. I never thought that a name, my name, would make such a difference in my identity, in my sense of myself, of my sense of self in relation to others. It does. It makes a big difference. I think about names a lot now, especially when I teach and meet with students, faculty, and staff in the library. I’ll usually ask a person’s preferred name. If their name is not one I can readily pronounce, I’ll ask the person if they feel comfortable stating it for me so that I can repeat it back. I acknowledge their name, because it’s an extension of who they are, of their general personhood. I don’t assume that someone will be ok with me “not even trying to say that” because it’s not ok to deny that basic part of a person. Libraries and classrooms should be a place of belonging and rightness for people. That starts with a simple effort to say a person’s name correctly, or as best as you can. It’s a simple act, but it matters to people. It’s an expression of respect, an acknowledgement of their inherent human dignity, and a demonstration that you are ready to engage in communication with empathy and decency. It’s something we should all do at our libraries, on our campuses, and in life. Veronica, thank you once again for addressing and reflecting on an issue that may be hard to talk about but for that reason is important to acknowledge. You conclude that the issue of recognizing the significance of names and identity is “something we should all do at our libraries, on our campuses, and in life” — thank you for including that whole scope; I am becoming newly quite sensitive to the “in life” part. I married my husband over 30 years ago, and after some soul-searching decided I would not change my name. I felt I had reached an age and established an identity that I didn’t wish to diminish by becoming “Mrs. Someone Else”; my husband had no objection, and my decision was not so very unusual for the 1980s. Here we are well into the 20-teens, though, and I am finding that having a different surname is still apparently an oddity. My husband died (much too young) this past spring, and in addition to grieving and learning to keep living, I am obliged to conduct all of the business involved in tidying up after one who is gone. Each time I call a business to determine what needs to be done to close an account, change a primary account holder, etc. etc., I often have to go through one of several variations of the conversation where I explain that my surname is not the same as my (deceased) husband’s, and clarify just what name it is the “customer service” person should be looking up or entering into a record. It is clear to me in these exchanges that my choice to reflect my independent identity through keeping the name I’d had from birth is still an oddity, not a norm. I find it very peculiar, and rather wearing to have to explain. Thank you for providing an excellent phonetic representation for Arellano — I’ll practice, in the event that we might meet in person one day and I can greet you appropriately! I’m so sorry for your loss, Debbie. I hope that the hassles you’re currently dealing eventually come to an end. Thank you so much for sharing your experience. Thank you for sharing so much of yourself in this post! I didn’t even know you were changing your name to officially include Arellano–I am so happy for your decision! I labored over my name for 5 years too, and then had a fight with the social security admin officer who advised me to “just take” my husband’s name and “not complicate the matter” further when I chose to only add, not hyphenate, and not drop my own name. I always think of the film version of The Crucible, when Daniel Day Lewis, as John Proctor, screams, “But it’s my naaaaaaaame!” So important. Yes – Rabinowitz – not that hard to pronounce really, or spell for that matter. It’s one of the first words I learned to spell. Not sure I could even list how many different ways it has been mangled, or how many times people don’t even try to say it. Most of the time, when asked, I just automatically spell it and never say it. What is that about. I almost never say my own name out loud anymore. Ronnie – I think you have inspired me to just say my name when asked for it and to see what happens. Veronica, names and words are so important. Kudos on reclaiming your name and background. They are you. I’m a Central Valley native to California. My mom and her siblings immigrated to the U.S. as young adults. However, their last name is Bedoy. Not a common Mexican name, although I do see Bedoya a lot more. When my mom married and had her half-Anglo children (my dad is from Arkansas), she was very adamant that we have “American’ names. So we’re Lindsay Ann, Alyssa Lovie (I think it’s a southern name), and Steven James. My mom uses Bedoy as a middle name, similar to where you previously placed Arellano. For my whole life, I have struggled with these identities. I sometimes wonder if my name were different if I would feel more at ease. I will have to think about this more. Even commenting on this makes me uneasy because I do recognize the power in being perceived as a white woman. Identity is a messy thing. Congratulations on your name change. I’m happy for you. Thank you so much for sharing, Lindsay! I am becoming more and more aware of how complicated identify can be, and like you, I think erring on the side of letting people identify themselves, pronounce their own names as they want to hear them said, and giving people that voice is the way to go. I wonder sometimes about my own son – Liam Connor Douglas – whose name makes him sound as Irish as one can possibly get. We decided to honor our first son by giving Liam his name as a middle name, which totally takes out the Arellano. I don’t want to force Liam to identify in a way that makes him uncomfortable, but it is very important to me that he know I am Mexican American and so are his grandparents, cousin, and aunt.